Arts leaders have praised Sunderland for its innovative partnership approach to culture-led regeneration. Today’s publication of the Cultural Cities Enquiry describes Sunderland as a pioneer of culture partnerships and urges other areas to learn from the setting up of Sunderland Culture. The Cultural Cities report was launched on 5 February in London, at a meeting led by Independent chair, Dame Jayne-Anne Gadhia, Arts Council England chair, Sir Nicholas Serota, and members of the expert Advisory Board. Members of the independent Enquiry champion the power of cultural investment to drive growth in our cities. 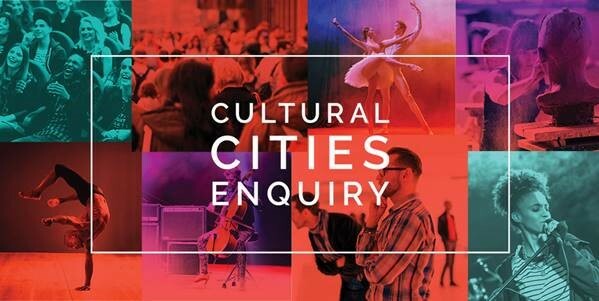 Originally coming together in March 2018, the Cultural Cities Enquiry set out to develop a new model that would enable culture to flourish in cities facing diminishing public funding. The Enquiry outlines how UK cities can make greater use of cultural assets to promote thriving communities and to compete successfully for talent, tourism and investment – while developing new income streams that will support culture for the long term. It also emphasise the role of culture in attracting people to cities as places they want to work, live, and play. Chief among its recommendations is the creation of Cultural City Compacts that will bring together civic leaders and partners from culture, business, and education, to make best use of resources and secure the social and economic benefits that come from embedding arts and culture in civic life. These Compacts will deliver against local priorities such as regenerating high streets and post-industrial quarters, establishing creative clusters, developing tourist revenue, supporting local creative talent and building civic engagement. Sir Nicholas Serota, Chair, Arts Council England: “Successful cities are those that create opportunities for people to earn their living, make friends, bring up families and engage in leisure and sport. Culture makes a vital contribution to these activities, while the creative industries are our fastest growing business sector. This Report shows how we can make best use of our cities’ cultural assets to build strong communities for the future. The Minister announced a £220,000 fund to be shared between nine or ten early adopters of the Culture Cities Compact. It is expected that Sunderland will be one. Sunderland Culture Company is an innovative model of cultural leadership between the University, City Council and Sunderland Music Arts and Culture Trust. It manages five major venues owned by the partners, delivering large scale cultural projects. Resources are pooled to support a single management team, a central ticketing system and programme planning across all venues. The Culture Company generates income from its venues and acts as a central platform for negotiating national funding. It is the driving force behind a major regeneration on of the city centre in the establishment of a Cultural Quarter, and runs health and wellbeing programmes in Sunderland’s local communities. Strong and sustained collaboration between strategic city partners can support collective, coordinated action to grow a city’s cultural ecosystem, to drive lasting social and economic benefits. Cities (like Sunderland) with a clear vision for culture supported by business, city authorities, education and the cultural sector can align activity and funding and leverage new resources. Graeme Thompson is quoted in the report on the subject of leadership: “The key is to bring together partners who will commit to a shared vision around the impact that culture can make across a city. The report demonstrates how business and cultural sectors can work together to plan and support local growth through culture, based on their shared interests in promoting creative and digital innovation, capturing external investment and attracting and nurturing talent. Launched in April 2018, the Cultural Cities Enquiry brought together expertise from across the business, property and urban regeneration, creative industries, hospitality and cultural sectors, together with city authorities, to identify scalable solutions to drive inclusive growth in cities through investment in culture, drawing inspiration from innovative models across the UK – including Sunderland. WHAT DID THE ENQUIRY RECOMMEND? Cultural property assets: Making strategic use of cities’ cultural property assets to revive high streets and city centres, and help prevent displacement of cultural activity in the wake of urban regeneration. Jeremy Wright MP, Culture Secretary: “Cultural investment can be a huge catalyst for regeneration and this valuable and far-reaching report shows how we can help creativity thrive in our communities. "I'm happy to confirm government will support the Enquiry's key recommendation to create Cultural Compacts. Local people know their towns and cities best. By bringing people together to work in partnership, I hope the culture and creativity that makes our communities unique can continue to flourish."